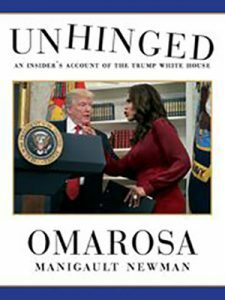 After Laura Ingraham’s call for racial cleansing and the release of Omarosa’s book we now have the president of the United States — a paragon of bigotry and treason — calling a back woman, Omarosa, a dog. The former Trump aide and Apprentice cast member says in her book, Unhinged, Donald Trump is a racist and misogynist — gosh, like we didn’t know. Whatever you think of Omarosa’s credibility — most of us think she has little or none — it comes as little surprise the president has denigrated another black woman with a slur so severe most people don’t ever use it. When’s the last time you called someone, a woman, a dog? Men used to like calling women they consider “ugly” dogs. As we get older we realize that sort of verbiage is unacceptable, even in the most vexing of situations. Name calling in personal relationships is nothing less than childish and we find out doesn’t win arguments or brownie points. Since coming down that escalator and calling Mexicans drug dealers, rapists and murderers — but he assumed some are good people — when he said Mexico is not our friend, the president has let it be known that his presidency would be built on extreme racial and nationalistic philosophies. So it shouldn’t be a surprise that he called a black woman a dog, or Don Lemon dumb, or that his chief of staff John Kelly called a sitting congresswoman — who is African-American — an empty barrel, while telling a lie about her. It’s no surprise white supremacists have embraced Donald Trump as their president. Just over a year ago racists marched in Charlottesville, VA After violence erupted one anti-racist protestor was murdered by a white supremacist. Trump’s response: there are good people on all sides. The only surprising thing about Omarosa Manigault-Newman’s book is that she just figured that out after so many years knowing the guy. Years after other people pointing out Trump’s covert and overt- racism. Republicans used to deny their policies were racist, despite the overwhelming evidence that GOP gerrymandering, Voter ID, and other acts of voter suppression disproportionally marginalized minorities. Same with cutting back funding for Medicaid, SNAP and other programs designed to help the poor, especially the working poor. In the 2012 presidential campaign GOP candidate Mitt Romney and his running mate, Speaker of the House Paul Ryan, made it clear poor people were the problem. For Trump there is no need to cloak his racist appeals. Black people are dumb, Hispanics need to have their children taken from them, and women … well, he hits on his daughter — in public — that alone should inform us about his views. Is it no wonder his third wife, Melania, swats away any efforts on his part to be affectionate? So it’s no surprise a Fox News host can go on TV and in a scripted editorial call for racial cleansing when it comes to immigration policy. What would be next? An out right call to start deporting people of color, regardless of their citizen status? Brown-skinned people have to prove they are legal residents or citizens already in some parts of the country. How long before the rest of us have to start producing our papers? Years ago while in the U.S. Marines I was traveling on a bus in Arizona, from Yuma to Phoenix. It was pulled over by the Border Patrol and several of the passengers, including me, were told to produce our ID and to prove we were in the U.S. legally. It was humiliating. I had to produce my military I.D. and driver’s license and the officer wanted to know why I had an Arizona license if I was born in Wisconsin. Well duh, I was stationed at MCAS Yuma, AZ. That threw up all sorts of red flags for the officer who couldn’t grasp the idea that if you are going to live and operate a motor vehicle in a certain state, you need a driver’s license for that state. Apparently I wasn’t white enough for the officer. Requiring people of color to produce their identification and proof of citizenship will eventually start to bleed over to us Caucasians that don’t look white enough for law enforcement, if it hasn’t already. It shouldn’t even get that far; it shouldn’t have gotten this far. The more racism is institutionalized, the more innocent people will be rounded up and treated like dogs, put in cages, run by for profit prison companies. It won’t be just brown people, white people. Sheesh, most people don’t treat their dogs that way. There are no decent people in the GOP running for office this year. If there were they would be speaking out about the president’s racism and misogyny. They would not be equivocating about supporting him. Which makes the 2018 Mid-Term Elections so important. The GOP won’t rein in his racism, misogyny and treason so we need to put people in office who will.